Putting together your coin want list is kind of like making a Christmas list for Santa Claus… only you have to buy the coins on that want list. Oh, and it may take a while to actually get all those coins! You can list out all your coin goals in one convenient place. A want list can help a coin dealer track down the coins you need for your coin collection. 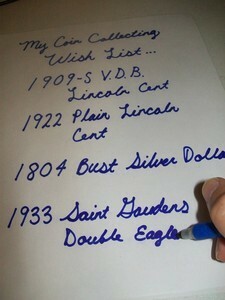 A coin want list is a great way to visualize what you’ll need to round out your coin collection. Many coin dealers accept coin want lists and will gladly help you acquire the coins you’ve been searching for.